You get off the train at the Charni Road Station, make your way out of all the hustle and bustle at the exit, and you encounter a structure so beautiful and humbling, you fall in love with it. This beauty is the Saifee Hospital at Charni Road, and for tourists, it is hard to believe a hospital could be this beautiful. Charni Road has a very interesting history behind its name. When the British Government raised a grazing tax, people didn’t know where to take their cattle. It is then that Jamshedjee Jeejeebhoy purchased grasslands near Thakudwar and opened them for the people to graze their cattle. Since then, it came to be known as Charni Road, with ‘charni’ meaning grazing in Marathi. Now after so many years, this place is bustling with people busy with their lives. The close proximity to the sea also makes it famous. It has a few famous colleges, and the young crowd here is energetic and inspiring. This has attracted all kinds of street food joints getting opened here. 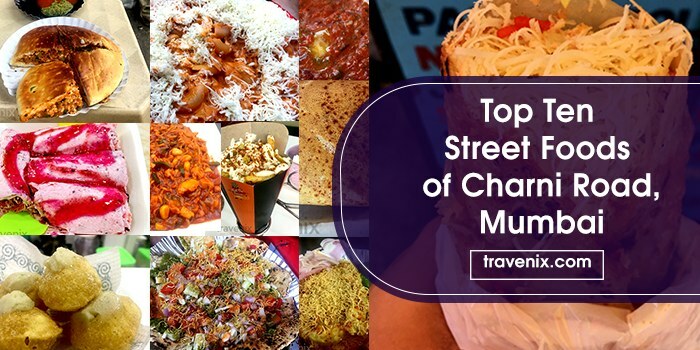 The streets are filled with a variety of foods, making your mouth drool and your tummy hungry. Shedding the restaurant tradition, the people here have taken to the streets to make, sell and eat everything delicious. From sodas to milkshakes, from a dosa to a locho, cuisines from almost all over the country are found here at affordable prices. 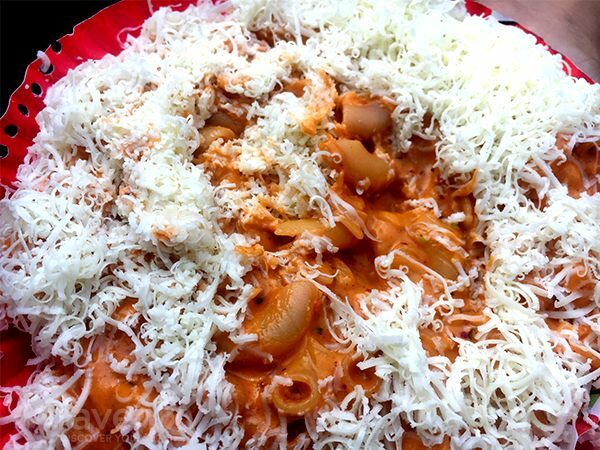 The Pink Pasta here is definitely one of the most amazing pastas you’ll find on the streets. The red and white sauces are mixed to perfection to create a heavenly dish. The macaroni pasta used is boiled well, and takes in the true flavor of the sauces and spices. Fresh Cream is used in making of the white sauce and this makes it rich and creamy in nature. This delicious dish is then topped with lots of shredded cheese which makes it even more flavorsome. Our verdict? 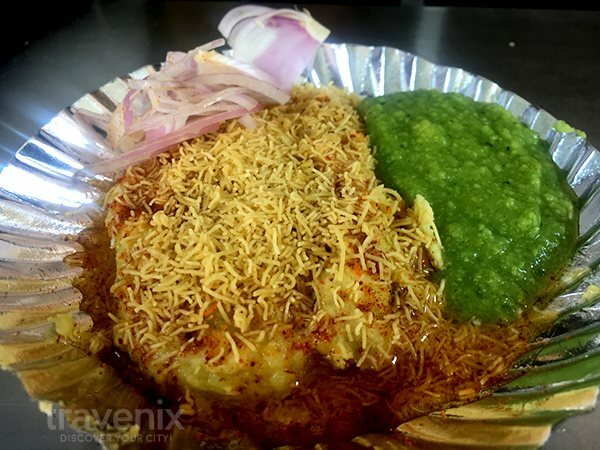 You just can’t be in Mumbai and miss out on this gorgeous food! Khichiya papad is probably one of the most loved papads in India. Crunchy and chatpata, this khichiya papad is extremely yummy. 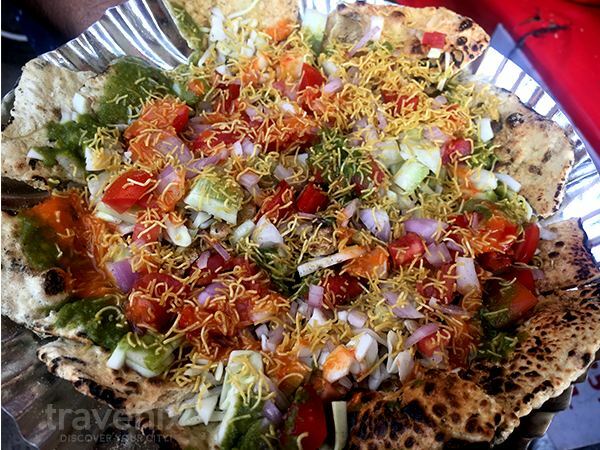 The papad here is properly roasted, topped with veggies, lahsun and pudina chutney, sev and spices. Overall, really tasty and a perfect evening snack. A novel and interesting concept, this ice cream tastes chatpata like a pani puri sorbet. 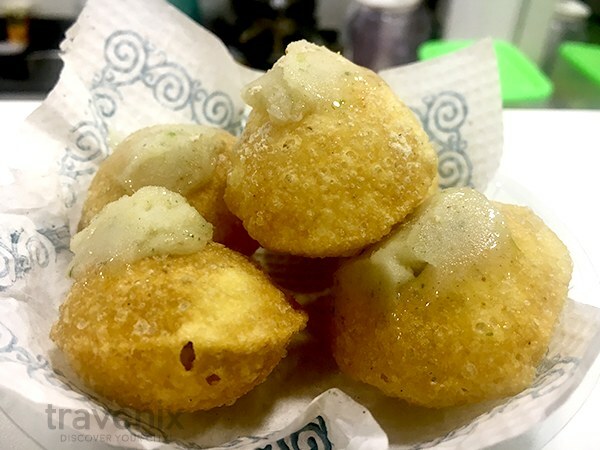 Just like a pani puri, you’re served water balls (puri) filled with pani puri flavored ice cream. A bite into the puri and you taste the chatpata flavor but as it melts in your mouth, it leaves a slightly sweet aftertaste. For all you pani puri lovers, it is worth a try. Our verdict? Yummy, but the water balls (puri) can be filled with more quantity of ice cream. This dish gives a yummy twist to our beloved Masala Maggi. 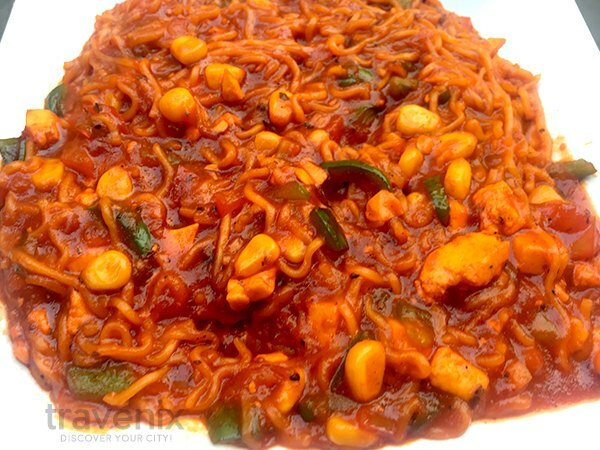 The regular maggi noodles are mixed with various other sauces and spices, making it tangy and cheesy. It has a strong overpowering tomato flavor which makes it tangy. Besides this, the other ingredients are mixed well, giving you a tasty and slurpy dish. 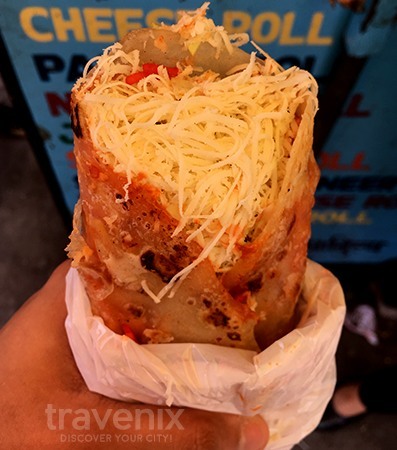 True to its name, the samosa cheese frankie is loaded with cheese. A regular tasty samosa enveloped by a soft chapatti with schezwan sauce spread all over, this frankie is both tangy and spicy. It is crispy because of the samosa and the green chutney in the center is a surprise. It is slightly salty, which tends to mess with the overall taste but the schezwan sauce has an overpowering flavor, neutralizing it. 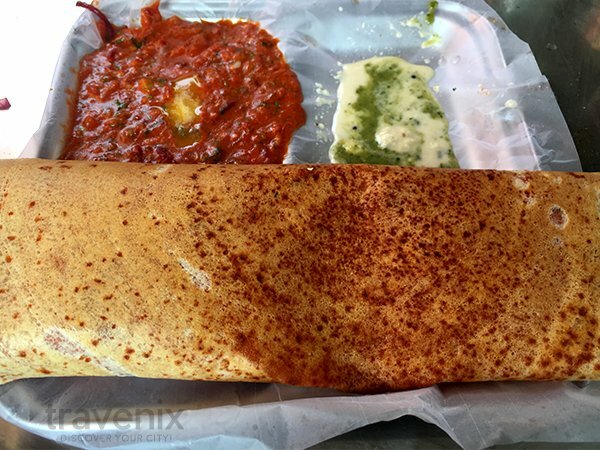 This is hands down one of the best Dosas we’ve had on the streets. This cheese chilly dosa has a crisp base, topped with mixed veggies which are mashed well to create a perfect flavor. This veggies’ mix gives it a smooth texture that basically melts in the mouth. 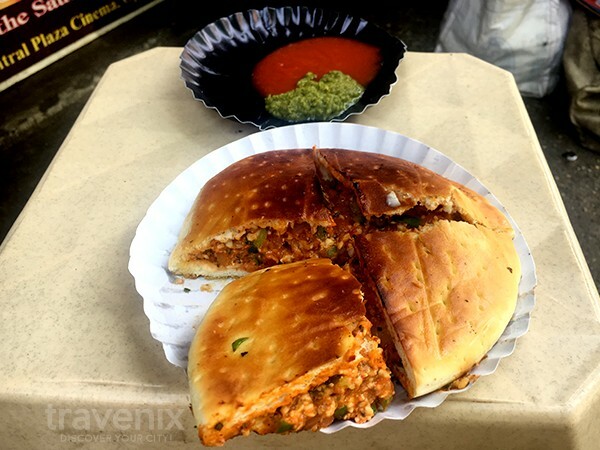 Amazingly tasty, it has cheese, tomato sauce, schezwan sauce, spring onions and butter. The Garam masala added to the veggies unravels a very distinct and satisfying taste. The coconut chutney served on the side is mixed with pudina chutney, making it even more palatable. Our verdict? Yummy in my tummy! 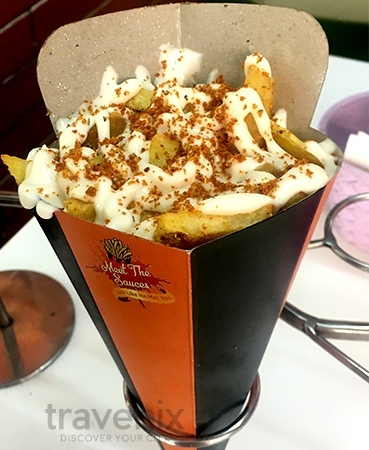 The cheesy piri piri fries are your regular, crispy french fries topped with loads of yummy cheese sauce and sprinkled with piri piri dusting. The sauce is delicious in all definitions and for cheese lovers, it is something to die for. The sauce has a sour cream and cheesy flavor in the aftertaste and the piri piri makes it not just spicy, but also slightly tangy. The ulta pizza can almost be mistaken for a sandwich but it’s not! It’s like two pizza slices, on top of each other with the one on top being ‘ulta’. The pizza topping in this case acts as the stuffing and is delicious with loads of fresh veggies and yummy sauces. Cheesy and tangy, this has an authentic Indian pizza flavor. The place is also open till 2 AM., for all you night owls. 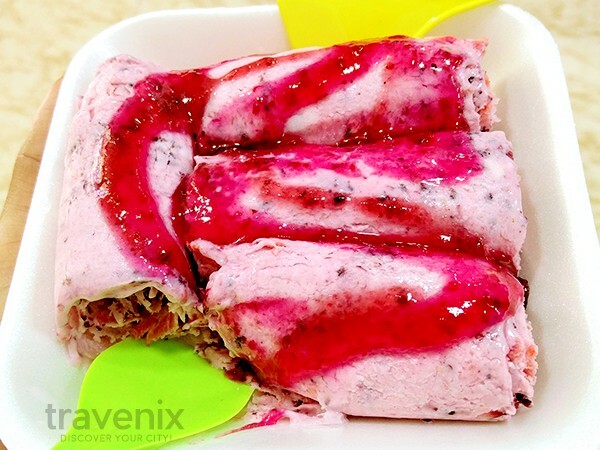 Ice cream rolls with fresh mulberry and strawberry made live in front of your eyes! This place lets you witness the creation of your ice cream, which is rich, delicious and satisfying. The taste of both the fruits is strong because of their freshness, and the milk used gives it a very rich flavor and smooth texture. Locho is a soft tikki made out of gram flour and loaded with ghee. Mixed with mild spices and chopped coriander leaves, the locho has a strong taste of ghee with a slight kick of chilly. It is topped with sev that gives it crunchiness and is good to go with your evening tea. 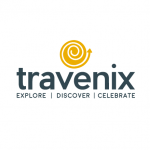 Gone around and explored more at Charni Road? Tell us all about it in the comments below!